Click on any question below to view the answer. Don’t see your question listed? 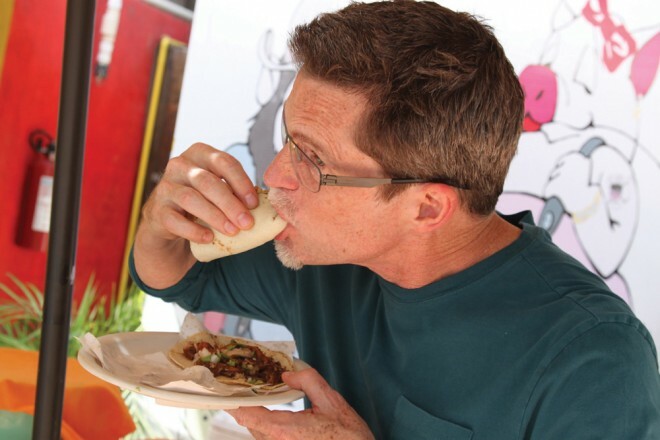 Write to us at faq@rickbayless.com. We’d love to hear from you. Where can I find information about equipment used in the television show? Stove: Combination gas and electric with a built-in grill/griddle made by FiveStar. Outdoor Grill: Rick uses a hybrid grill, which can use either propane, charcoal and/or wood. It’s manufactured by Kalamazoo Outdoor Gourmet. Blender is made by VitaMix. Stand Mixer is made by Kitchen Aid. How can I apply for a Frontera Farmer Foundation grant? We normally post the grant application at the beginning of October and the deadline for submission is the end of January. The eligibility guidelines are posted (along with the link to the application) on the grant application page. You’ll also find additional information there on the Foundation, including how to make a donation. How do I build an outdoor pit? The directions for building a pit like Rick has in his backyard are in the Slow-Roasted Yucatecan Pig in a Pit recipe. Where does Rick get his cool T-shirts? Some of the t-shirts, Rick gets as gifts. Many of the ones he wears come from these two sources: CafePress – an internet site and a store in Pilsen neighborhood, just southwest of downtown Chicago called OMB Chicago. What are the boxes that Rick uses for container gardening? They’re called Earthboxes and Rick uses them both in his home garden and on the rooftop of the restaurants. Earthboxes are a self-contained growing system that allows you to grow vegetables in any space. Each Earthbox comes with potting mix, fertilizer, a water reservoir and even an optional staking system. They’re portable and reusable. Check outearthbox.com for more information. Where can I get tomato and chile seeds? For a large selection of both hybrid and heirloom seeds, check out either Seeds of Change orJohnny’s Selected Seed. Where can I get my hands on Rick's Avocado Scoop? The infamous avocado scoop was part of the line that Rick designed for Copco which they are no longer manufacturing. OK then, what about the Chile Roaster, the Cookware, and the Serving Pieces? These were all part of the Copco line that Rick spent two years designing and bringing to market only to have Copco drop his line when they sold the company. At this point, none of these items are available. We are in discussion with several manufacturers to bring back the stovetop chile roaster. How do I find a local station that airs Mexico: One Plate at a Time? The television show airs on PBS and also on the Create Channel on cable. Use the PBS Station Finder which you’ll find under the television tab on the web site. Put in your zip code to find your local PBS stations. Click on the station and search for Mexico: One Plate at a Time. If your local station doesn’t carry the show, you can log on to the Create web site and check there. You can also contact your local PBS station direct, and request that they start airing the show. Local program directors base their programming choices in part on their members suggestions. What is the reservation policy for Frontera Grill? We take a limited number of reservations at Frontera which you can make by phone at 312-661-1434 or on our website. Most of the tables both in Frontera and our bar are seated on a first come-first serve basis. For weekend reservations, we suggest 6 to 8 weeks in advance. What are hours and reservation policy for Topolobampo? Topolo is open for lunch Tuesday through Friday and for dinner Tuesday through Saturday. You can make a reservation through our web site or by phone at 312-661-1434. We recommend 6 to 8 weeks in advance. How can I join Rick and the staff on their annual trip to Mexico? We take one couple with us on our annual staff 4th of July Mexico trip. This is one of the silent auction prizes that we offer every year at the Frontera Farmer Foundation benefit held in June. It is an all-expenses-paid trip and the bidding starts at $10,000. The proceeds go to funding our grant program for Midwest family farms. How can I sign up for Rick's cooking classes in Mexico? Rick teaches classes in Mexico once a year usually in the early spring. The classes are offered as part of a week-long program organized by Marilyn Tasend with Culinary Adventures, Inc. Every year this program visits a different region of Mexico. For more information about this program, you can contact Marilyn either by phone (253) 851-7676 or via email. Frontera Fresco is a fresh, quick-service restaurant concept created by Rick in partnership with Macy’s. The restaurants feature authentic Mexican street food with a menu of tortas, huaraches, tamales and quesadillas, plus small-batch, chile-infused salsas and Frontera’s handmade, taquerstyle tortilla chips. You’ll find two of them in the Chicagoland area, one at Macy’s State Street and the other at Macy’s Old Orchard. The third one is in San Francisco at Macy’s Union Square. You can sign up to receive our e-newsletter by using the form at the bottom of this page. Where can I find Frontera Foods products? Nationally available at Whole Foods. For more information, contact Frontera Foods at 800-559-4441, ext. 120, or via email at info@fronterafoods.com. You can also learn more about Frontera products and place an order on fronterafiesta.com. If you don’t see your question listed here, contact us online or send an email to: info@fronteragrill.net.